Indented quoted sections are taken from the original article. The second program I wanted to demonstrate is one I wrote one day while studying my Stone Table Software customer list. I was looking at all the emails — many from foreign countries — and I started wondering what percentage of my customers come from which countries. Email addresses and domains aren’t a surefire way to determine a person’s origin, but they can tell you a little. So I sat down and wrote this little program which accepts a text file of emails (one email per line) and sorts and counts them by extension (.com, .net, etc.). 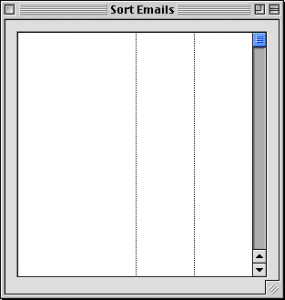 I’ve updated the program for the version of REALbasic noted about, and altered it to open a file and display a count of the total e-mails in the list. Drag and drop doesn’t seem to work on Windows. To start, create a new project in REALbasic. Using the default Window1 that’s created for you, drag a listbox onto it. Make the listbox big so it fills all of Window1. Double-click emaillist to open the Code Editor. me.Heading(-1)="Domain" +chr(9) + "Quantity" + chr(9) + "%"
This names the listbox’s headers. Now go to the DropObject event. This is a major part of the program. What happens is the user drops a text file on the control, so first we check to make sure they dropped a file and then we open it. We load up theList array with each line from the text file, then close it. We call a few other routines — stripList, sortIt, countDuplicates, and updateList — and then we’re done. Since Drag and Drop does not seem to work on Windows, I’ve added a PushButton to enable a file to be opened. The code for DropObject has been moved to its Action event and modified as follows. We need a file (FolderItem) and a text stream (TextInputStream). will open a file, and filter the file list to text files with “.txt” extension. The loop works the same way as in the original, but on the file just opened. The HeadingIndex for sorting just needs to reference the correct control now that it has been moved from the listbox. When you’ve got all three methods ready, let’s put in the code, starting with stripList. It’s a routine that deletes everything but the email extension from the email addresses. The algorithm used is a simple one: it simply looks for the last phrase deliminated by a period. Since all email address end in a dot-something, the text to the right of the dot is saved and everything else is thrown away (stripped). This way our list of emails is paired down to simple “com”, “net”, and other extensions. How does the above work? Well, the key line is the code in the middle of the for-next loop. To understand it better, let’s mentally run it the way the computer would, using a sample address. Process the end of it first. The code countFields("moron@earthlink.net", ".")) will return a number, the number of fields in the phrase delimited by a period. Since there is only one period in the phrase, there are therefore two fields (“moron@earthlink” and “net”, everything to the left and right of the period). So replace the countFields code with the number 2 (the result). So now our code is effectively saying, “Put field number 2 (the last) of ‘moron@earthlink.net’ into theList(i).” Since the second field is “net” we have effectively changed “moron@earthlink.net” to “net”! Note how we don’t use a for loop for the outermost loop; I used a while loop instead. I did this because the size of the loop changes: when we find a duplicate item we delete it, reducing the number of items in the list. Using a while loop means that the computer will keep repeating through the list until it reaches the last unique item. The final part of CountDuplicates is where we calculate the percentage of each kind of email. To do that we first need a total: not the number of elements in the list, but the total number of emails. So we count through the itemCount array, adding up each item. Since an itemCount element contains a zero if there’s only one of that item, we add a one to it to get the actual count. We finish by initializing the percentList array to the size of our list, then set each element in the array to the appropriate percentage. Note that we again add one to the itemCount value. I’ve added a line to report the total items in the list to a StaticText field called totalCount. Our final method for the program is the updateList method. This is used to display the information in emaillist. It first deletes any existing rows in emaillist (if you didn’t do that, dropping a second file on the existing listbox would display the wrong content), then counts through the list of items. For each item in the list, it puts the content in the appropriate column of the listbox. The first item is in the addRow command: that’s the “.com” or whatever was part of the email address. Once we’ve added a row, we don’t want to add another, we want to work with the row we just added. So we use the lastIndex property which contains the index number of the last row we added. We use the cell method to put the actual item count (again, we add one to it) and the percentage into the correct columns. Save your program and run it. It should display a simple window with a listbox in it.